The multi-layered process used by Daniel Lefcourt produces seductive works that hover between hand-made and machined, abstract and representational. For an earlier body of work, the artist pulled imagery from accidental textures and spills found on his studio floor that he translated into 3D printed shallow casts used to transfer the image to a canvas. For this series, a reproduced image lies below splattered pigment. 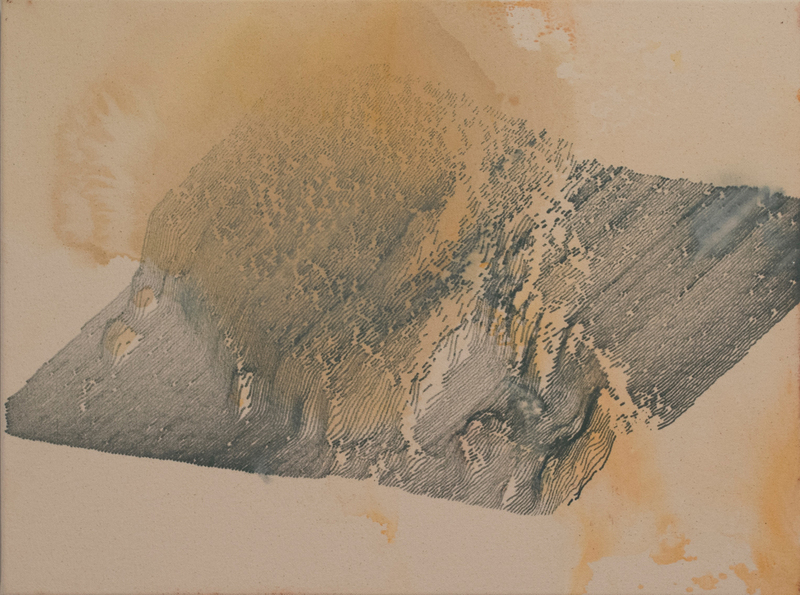 This work’s topographic quality, mapping peaks and valleys, is further informed by the title of the work, Terraform (Urras). The imagery could be a sea floor map, a print of a mountain range, or an enlargement of a miniscule bump. The title, too, builds mystery and connects to geographic exploration, as many of his works draw from literature — Urras likely referring to an imaginary planet used as a setting in a series of 1970s sci-fi novels. Lefcourt has exhibited his work at galleries and museums worldwide.